When you hear the name Fragrance Direct, you think perfume/aftershave but maybe not necessarily skincare or other beauty items, but you should! I was really pleasantly surprised when I saw that they stock luxury skin and beauty brands such as Elemis, Murad, Clinique, Decleor, Nars, Clarins, Alterna and more. All products are 100% genuine and they offer free UK delivery on orders over £20 or free International delivery on orders over £75 but if you don't want to spend that much, their delivery charges start at £4.99. I had a good browse of the site and most prices are the equivalent to those in Duty Free, with some brands being reduced by up to 60%!! 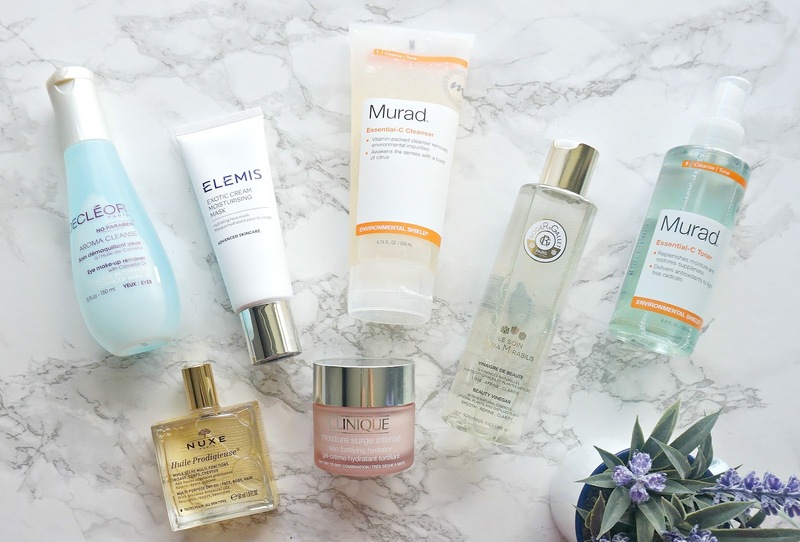 This post is not sponsored, however Fragrance Direct did send me some products to try as they know I love luxury skincare and today I want to share my thoughts on the products with you. You know I wouldn't recommend anything that I wouldn't spend my own money on so you can trust me when I tell you that there are good deals to be had! I told the lovely P.R. girl about my skin type and concerns and she chose which products to send me based on that. When the parcel arrived, I was delighted to find that I hadn't actually tried any of them before! The first product is Decléor Aroma Cleanse Waterproof Eye Make-up Remover, which is a real treat for me because I only ever use budget eye makeup removers normally. This is a bi-phase makeup remover so needs to be shaken before use. I applied some of this to cotton wool pads and held them over my eyes for a few seconds before wiping away and it removed every last trace of my makeup without leaving any residue in my eyes (I hate the cloudy after-effect that some makeup removers leave). I don't wear waterproof mascara but it did remove my Kat Von D Tattoo Liner completely. This has a saving of £6.05, reducing it from the usual price of £21 to £14.95 on Fragrance Direct. Murad is a brand that I've only ever tried samples of products from before so I was delighted to get the chance to try two products from the Essential C range. The Murad Essential C Cleanser is packed with anti-oxidants to protect against environmental damage and it also contains Vitamins A, C & E to brighten and infuse moisture into the skin. It is different in texture from all other cleansers in my collection because it is quite a watery-gel texture. It has a really beautiful, citrus scent, which is really refreshing and perfect for a morning cleanse. It is applied to dampened skin, massaged and then rinsed with warm water. Although this is described as a product that infuses the skin with moisture, I didn't find that to be the case - my skin felt quite tight and uncomfortable after using it. Bear in mind that I have very dry skin so if you have normal to slightly dry skin, this would probably work for you but if you have Sahara-like skin like I do, then I would skip it and try a different cleanser fro the brand instead. That being said, I absolutely love the Murad Essential C Toner, which like the cleanser, has a beautiful citrus scent and also contains antioxidants to protect the skin from environmental damage. This product actually added moisture to my skin without leaving it feeling like there was a layer of extra product on the skin. The spray isn't particularly fine so I wouldn't use it over makeup as a refreshing spray during the day, but as part of my skincare routine, it is now a firm favourite. The product that I was most excited about trying was Roger & Gallet Aura Mirablilis Beauty Vinegar because I had seen it featured a lot in the blogosphere late last year. I was curious about it because I like vinegar on my chips, but not on my skin and wondered how it would work! It is basically a toner for the face (I used it after my cleanser and before spraying the Essential C Toner), which contains 18 plants in the essence phase and fruit vinegar in the water phase. It has a light floral-fruit scent and as it is a bi-phase product, it needs to be shaken before application. I use this daily on a cotton pad sweeping it all over my face and neck to remove any makeup residue (although I'm militant with cleansing so there is rarely any) and get rid of dead skin cells. This leaves my skin feeling soft and smooth and my pores look refined. It isn't at all stripping as you might imagine a vinegar to be - my skin feels really comfortable, yet it doesn't leave a residue. It's an all round brilliant product and one that I will repurchase whenever I finish it. Regular readers will know that I love Clinique Moisture Surge Spray so I was delighted to receive the moisturiser from that line: Clinique Moisture Surge Intense. I had previously tried the regular moisturiser, which wasn't moisturising enough for my dry skin but this Intense version really packs a punch in terms of the moisture it delivers. It is a gel cream, which makes it cooling on the skin (perfect for the upcoming summer months) and it really quenches my skin's thirst, without being greasy, to leave it soothed, plump, soft and radiant. I absolutely love this moisturiser and don't know why I didn't try it before. This is priced at £29.95, with a saving of £4.05. As a bit of a face mask addict, I was delighted to receive an Elemis face mask designed for dry skin - Elemis Exotic Cream Moisturising Mask, which is priced at £29.95, again with a saving of £4.05. It's a while since I used any Elemis products but it's a brand that I hold in high regard because most of the products I have used in the past really suited my skin and I could see and feel a real difference and this mask is no exception. This mask heals, nourishes and hydrates my skin. It contains honey (to repair and hydrate the skin), samphire (to strengthen the skin) and bergamot (to moisturise the skin). The mask has a light fruit/mild herbal scent (I find all Elemis products to have a very spa-like, relaxing scent) and the texture is that of a light cream. I apply this twice weekly after exfoliating and I will either leave it overnight or rinse after about 20 minutes. Either way, the result is very soft, supple, plump and nourished skin. It is perfect for dry and sensitive skin. The final product I received is a bit of a cult product - Nuxe Huile Prodigieuse Multi-Purpose Dry Oil. The first thing I noticed about this product is the scent - I remember having a shower gel from this line last summer and it hypnotised me then too - it is a warm, intoxicating, quite musky scent. This product contains a blend of seven precious botanical oils - Macadamia, Hazelnut, Borage, Almond, Camellia and St John's Wort were in the original oil and this updated version now also contains Tsubaki oil. This is the perfect product to take on holiday because it can be used on the face, body and hair. I have personally only used it on my body and a little in the ends of my hair because I'm unsure how the sensitive skin on my face would react to so many oils. Because it is a dry oil, it isn't greasy and it locks in moisture to leave the skin soft and supple. I can see why it has its cult status! Overall, I am really loving five out of the six products and will continue to use every last drop of them. If you want to invest in luxury skincare but the price tag puts you off, I highly recommend checking out Fragrance Direct because there are great savings to be made right across skincare, fragrance, makeup and haircare products plus they regularly have further discounts available, which you can be notified of if you sign up to receive their emails. Have you tried any of these products or shopped with Fragrance Direct? Do you seek out bargains online? I would love to hear in the comments below! All products are bought by me, unless otherwise stated. In this case, Fragrance Direct sent these products to me. This post is not sponsored. Opinion is always my own.